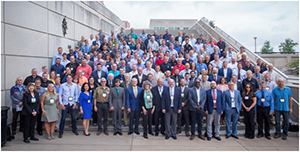 Photo Caption: The 13th Fumigants & Pheromones Conference and Workshops in Indianapolis, June 12-14, 2018. 180 attendees from 23 countries attended this biennial meeting on stored product protection hosted by Insects Limited and FSS. For details go to www.insectslimited.com. The 13th Fumigants & Pheromones Conference was held June 12-14, 2018 in Indianapolis, Indiana. This biennial conference on stored product protection had global representation from 23 countries, totaling 180 attendees. Dave Mueller, president of Insects Limited and conference organizer stated, “This stored product protection conference was the best we have ever had according to the evaluation sheets. "We learned so much from the speakers and our guests. "The two-day program, the hands-on workshops, the conference dinner all were fun and educational. Topics included pheromones, pest management in food facilities, fumigation research, stored product insect research, grain pest management, food borne disease disinfection of food plants, FSMA, and new rodent control technology. In addition, industry displays were available for attendees to browse through or ask questions directly to product representatives. The third day of the conference offered two hands-on workshops. Attendees could choose to learn more about Museum Pest Management at select local museums or go to a local food and grain facility to learn more about stored product protection. At the end of the conference, it was announced that the location of the 14th Fumigants & Pheromones Conference will be at Victoria Falls, Zimbabwe in the spring of 2020.